Price Paid: $40--watch for sales on Campmor! Great entry level hammock at a decent price. Hanging ropes are "okay." I replaced them. 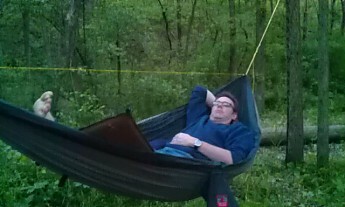 The Grand Trunk Skeeter Beeter Pro has been my entry experience into hammock camping. I originally bought this hammock on a whim because it was on sale dirt cheap. It's a great entry level hammock for those curious about hammock camping, but not wanting to spend a fortune. This is a revision of my original review, as I have used and learned much more about hammock camping in the last year. Weighing in a 28oz. the Skeeter Beeter and fly shaves nearly 2lbs off my pack, when you take into account the weight of a tent and footprint. While a true Ultralitest will just sleep on the ground with a tarp, I found the comfort of sleeping in a hammock is worth the extra ounces. Plus, the No-See-Um mosquito netting gives me what I need from a full tent. Adding a rain fly (in my case the Grand Trunk Funky Forest Tarp) protects from the elements. In the past year, I have spent a total of 20 nights in this hammock in all kinds of weather. I have slept in heavy snow, pouring rain, and nighttime temperatures ranging from mid-70's down to 23°F. I've retreated to my hammock as the mosquitoes have become unbearable. When mosquito netting is not needed. 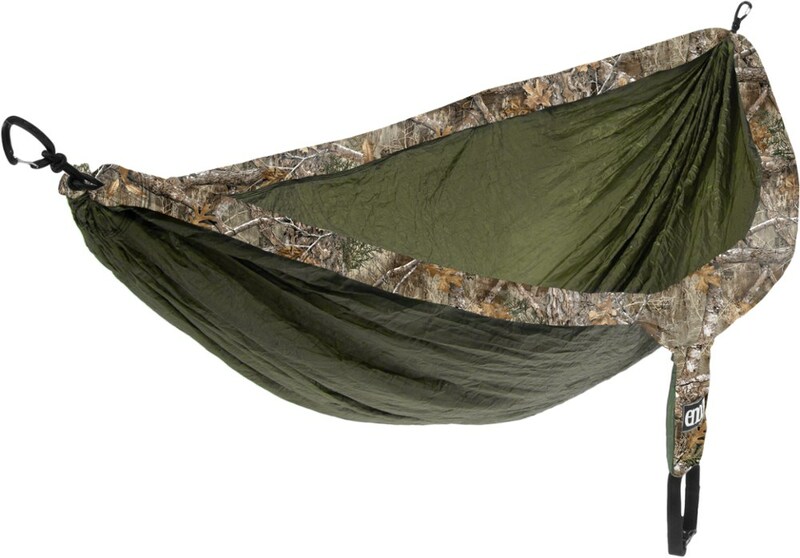 The Skeeter Beeter hammock can be flipped over and used like a traditional hammock. The picture below shows some modifications. I've added a hammock "ridgeline" made of Amsteel Blue. I replaced the prussic cords that came with the original hammock with Whoopie Slings made by Dutchware. A note on the hanging ropes that come with the Skeeter Beeter: They're "okay." If you are car camping or backyard hanging they'll do fine. If you are planning on using this for backpacking, there are lighter and better options out there. These are basically worthless sewn on pockets. I tried placing my Android phone in one—it fell out. My headlamp in the other...it fell out. I ended up just hanging everything off my hammock ridgeline in a small stuff sack. Finally, I'm not a fan of the shock cord system to hang the mosquito netting. Ditching their shock cord, I use Dutch Ridgeline Biners (again Dutchware) to clip it to the TARP ridgeline (clipping it to the hammock ridgeline leaves is dropping in your face. In summary: If you are looking to try hammock camping, this is a good place to start (Do your research though. Hammock camping is not as "intuitive" as pitching a tent...but OH! so much better!). Very good hammock. Best symmetrical hammock of its class. I would have given it 5 stars, but I don't like the stock suspension. See below for details. I'm 6' 2" and 220 lbs. I can sleep ultra comfy in it. It's super durable. By durable, I mean getting wasted in the woods with my friends and manhandling it in the dark many times over two years. It's been dripping in sweat from muggy Florida nights and it's had condensation freeze on the bug net from cold nights. I made some mods to it but the hammock itself is the best netted symmetrical hammock for its size. And it's low-cost AF. If you are less than 5' 10", I'd try the regular Skeeter Beeter, not the Pro. That hammock is great for you short folks. 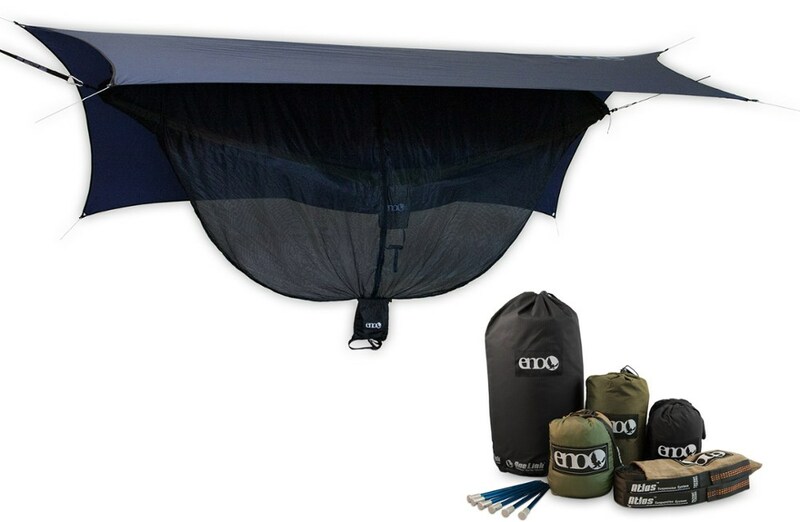 It comes with the GT Extreme Air Bivy. It was too small for me, but perfect for my girlfriend. Bigger the people, bigger the gear. Also the more weight. As long as your overall pack weight is less than 20% of your body weight, you're good. This hammock isn't as heavy as these gram-counters review it to be. Most of those guys can fit in smaller netless hammock designed for petite people. I can't. I live in Florida and the skeeters are like birds. With shelter and modified suspension I'm down to 3lb 10oz. With sleeping bag and underquilt for cold nights, it's under 7 lbs. Once the Abrigo tarp is available from GT, I'll be at less. I've laid in a hammock setup that was half the weight and it felt like it was going to rip and I was too tall for the hammock to be comfortable. 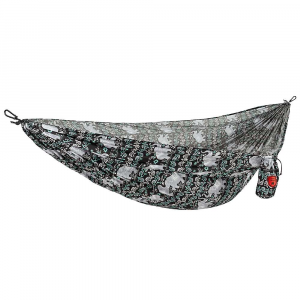 Dropping a pound in your hammock gear will cost you a lot lot LOT more money. Don't skimp on sleeping gear. Triple the price. Spend that money on a quality cooking stove or sleeping bag. I knew a guy that cut his mini travel toothbrush in half to save a few grams. He also only came camping with a tiny headlamp. Well I got a mini isobutane mix lantern that is AWESOME and worth the weight for the awesome light. I replaced the entire suspension with cinch buckles and dutch clips. I also added cordage to the zippers so they are easier to grab. The last mod I did was add four separate adjustable shock cords with plastic clips so I can attach them easily to a ridgeline or the GT All Purpose Tarp to hold the net up. I can deploy the entire hammock and shelter in less than 50 seconds with my mods. That includes staking out the tarp and adjustments. 15 seconds for just the hammock. Break down is at 2 mins 10 seconds. Most of that is wrapping cordage. I coat the hammock with permethrin so skeeters don't bite me from underneath thru the hammock. I have tried many others and this one is my favorite. Welcome to Trailspace, Jack! Thanks for sharing a review of your GT hammock. Do you have any pictures of it you could show others in your review? Glad to see I'm not the only Clydesdale out there camping. Thanks for the review, good information to help me get started hammock camping. Not sure what you mean by clydesdale. With luxary items my pack is 14lbs before food geared for weekend backpacking. Micro gas lantern, 48" camp towel, deck of cards, 450 x-keiryu rod with a few flies and a fillet knife, jetboil minimo with frying pan. And battery powered hammock lights. Of course, this is for weekend backpack parties. If i was thru hiking id rock my solo tent. Complete shelter with sleeping bag and pad is about 5lbs. Decent starter hammock, comfortable and adequate. Decent starter hammock, comfortable and adequate. If you hang out on the East Coast, get one. Easy as any other hammock but with some amount of frustration given the limited default suspension. You'll be seeking a replacement for this soon enough and then setup will be a breeze. More exactly, the main cords are short and only provide two hang points each, so you'll have to find two trees in a narrow range of separation distance and both with suitable trunk diameters. It's a hammock, and thus, once up, stable in that it's not going to collapse or anything. There are side webbing loops for staking out if one desires (widens body and stops swinging). The only item stopping this from being a "full kit" is lack of overhead weather protection, so get a tarp. Speaking of tarps, get one with as many tie outs as you can. Again, it's a hammock, so ventilation is not something you'll worry about getting enough of, rather the opposite. The body material breathes quite well and laying in warm weather will not result in any clamminess at all. I'm 6'4" and have no issues in this hammock. No issue using a diagonal lay to get a flat lay. There's not really much by way of useful storage when setup. The stuff sack/pocket is not durable and has become totally disconnected but was a useful headlamp, snack, TP storage while it lasted. I should note you can easily share the space with a medium sized dog if you use a diagonal lay. Super — there are no poles or non-collapsible elements, so just stuff the whole thing wherever. Quite easy in most ways, everything makes sense. Again, there are limitations when selecting a hanging location given the default suspension. Get a Dutchkit or slings from somewhere and enjoy having an easier time finding suitable trees. Integrated bugnet. It works as a bug net, but the shock cords are not worth the trouble or weight. Ditch them and just attach to your ridge line. Further, the sewing related to the net-hanging loops is weak — be gentle. Same goes for the net attachments to the body — be gentle. Attached stuff sack / night storage pocket. It's great — while it stays attached. After it falls off, just ditch it and enjoy carrying less weight. Hang low enough to use your pack as a night table or whatever. As noted above, some parts are a bit fragile, but I've no problems with the main body — good there; it's solid and the gathered ends have seen no problems. This is the first hammock I've used and it's been a great entry to hanging. It's on the heavy side (22.8 oz for body + 3.8 oz for ropes + 4.4 oz for heavy steel carabiners), so get a Dutchkit, lose the shock cords, lose the stuff sack and definitely the biners to drop some weight. I'm looking already to replace it with a more minimal hammock now that I've been introduced to hanging. But again, for the price, this hammock has allowed me to discover a great, great way to get a very comfortable night's sleep in parks with nearly no flat, non-rocky areas :) If you're curious about using a hammock, grab this one and try it out for a low price. Thanks for sharing this helpful hammock review, Joshua. Nice review. I now loan this hammock out to folks wanting to try hammock camping for themselves. This is a great hammock. It keeps the bugs off of you, but can feel claustrophobic. It is easy to hang once you get the hang (no pun intended) of it. It is a bit small to sleep diagonally if you are tall. Overall a great deal for the money. Storage bag which hangs on the side of the hammock does not work well with much weight in it. I have used this hammock in my backyard as well as on the trail. I have slept in it when there were so many mosquitoes out that I could see the clouds of them, but this hammock kept me free from any bites. Hanging the netting portion of the hammock can be difficult to do it in a manner that keeps the netting away from you when you get inside. I felt a bit claustrophobic, but was so tired that it didn't matter. I am 6 feet tall and I like to sleep flat. In a double wide hammock that is not a problem but in this it requires a bit of maneuvering to get close to flat. This hammock could use a few more inches of width. The length is great, however. This does not pack down as small as many hammocks but when you consider that it includes a bug net then it is comparable. I usually like to put a water bottle in the pocket but that is too heavy for it to hang without distorting the shape and getting in the way. It does come with hanging straps but they are merely ropes and are not very wide. I replaced mine with any system so it would not damage the trees. Welcome to Trailspace, Chris. I'm 6'2", and I find the Skeeter Beater to be long enough for me. But you are right that bigger is more comfortable! Thanks for the review, and I hope you will post more. Only had it a few months, been canoe camping with it. It doesn't take up too much space. It does keep the bugs away. Easy to set up, took a little while to get use to sleeping in a hammock. Quick to set up while taking a break—us old timers need our daily nap. Learning more every time I use it. I believe this is a very good deal. Welcome to Trailspace, Noble. 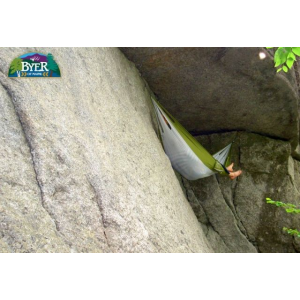 Can you tell us more about your GT hammock, like how long you've had it, how well it sets up, and how well it's fared? This is a great hammock. It is durable and comfortable. I have had this hammock for a little over a year. It is still in great condition with little sign of wear. It is very comfortable to use. The mosquito net may be set up with little hassle and is a big pro when camping or using in the outdoors. Welcome to Trailspace, Luke. Where and in what kind of conditions do you use your hammock in? Nice hammock for Florida. Two in one with netting. Other than setting it up in backyard, I have not camped with it. It does appear to have lot of room. The side entry with net makes it easy to get in. My biggest complaint is the tree strap setup. It is not long enough and also does not go with Leave No Trace principles. They were replaced with the ENO Atlas straps. Outside of the straps, it falls in line with most gathered end hammocks. The center ridge line could also have come with some type of hook system to make it easier to set up. Great hammock, perfect for buggy climates, quality materials. Solid hammock, works as you would expect a hammock to. Dimensions are plenty long, and wide enough, although I would prefer it if it were a little wider. Bug net works, zipper seems good quality. 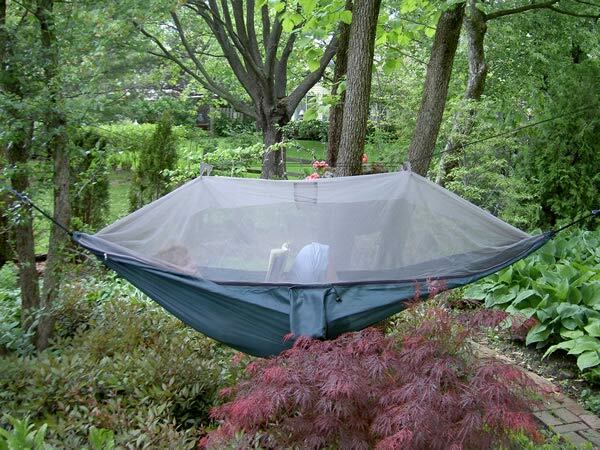 If there are no bugs and you don't want to sleep under the net, you can flip the hammock and sleep on the other side. Overall quite impressed. The only detractor I found was a crummy suspension that was included. This wasn't a huge issue or me because I had planned to replace it anyways, but something to consider nonetheless.